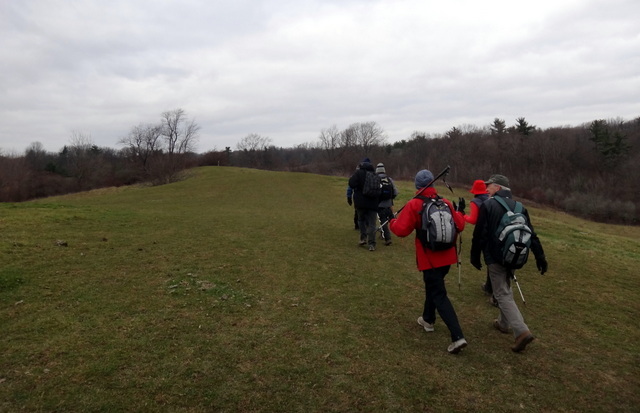 The Bruce Trail Conservancy’s Toronto Club End-to-End expected hikers to complete about 50 Km over two consecutive days. (There was a one-day option, but I decided to forego this ultra distance which would take me 10 hours of walking and took it easy instead.) 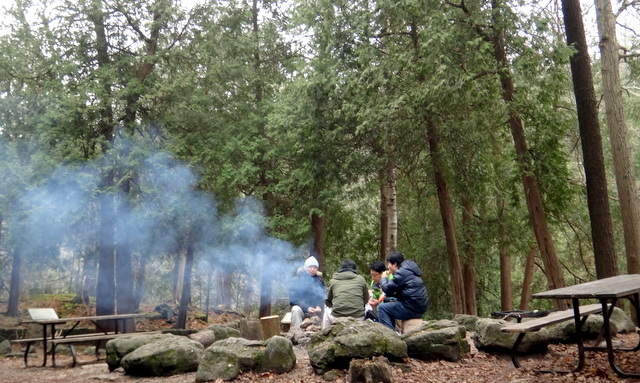 My group met at Limehouse in Halton Hills. This small community of about 500 people were still asleep when we arrived. 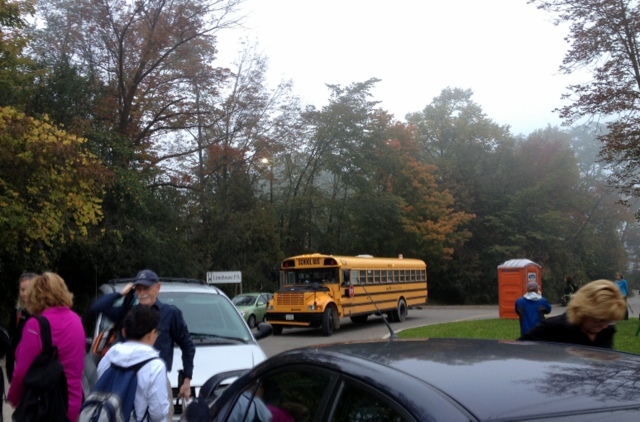 There were over ninety participants in this event and we were taken by bus to the start point which divided the Toronto Club section from the Caledon Club section. The first lag was the paved asphalt surface of Credit View Road and then Boston Hill Road. We were flanked on both sides by farmland. We passed a cornfield and an orchard. We walked over a kilometre before entering into the trail. The footing and the trail surface changed as soon as we were in the woodland. It was more shaded, but it also meant more obstacles. Some trees that had fallen across the trail were there for us to walk over or duck under. I negotiated three such tree trunks within a short distance. I felt like a horse jumping over hurdles in a steeple chase. This section soon ended and we were back on the road of Heritage Road, which led into the Caledon Trailway. After exiting the Trailway, we entered some private property by climbing over a stile, and out again, but not before we saw many apples by the roadside. They were likely from apples trees of an abandoned orchard in an area close to the Terra Cotta Conservation Area. The forest is a mixture of deciduous and evergreen tree. This is the military formation of tree planting. We had walked over 10Km and was glad to reach the first check point near Vaughan Road for some snacks. Leaving the Terra Cotta Conservation Area, we entered the Silver Creek Conservation Area for a totally different challenge and scenery. This was also a very rocky section on high elevation. I suddenly realized that I had been here before, when I came to this narrow rocky section. I was here in early spring here when it was still covered in ice and snow on what I called a treacherous hike. We were hiking by Silver Creek and the sound of the running water accompanied us for some distance. 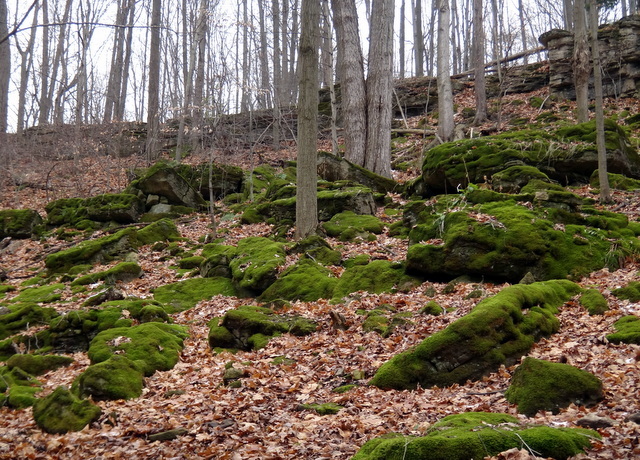 This was a well-maintained section by the volunteers of the Bruce Trail. We came across many bridges like this one. One more rocky patch and the second checkpoint was in sight. 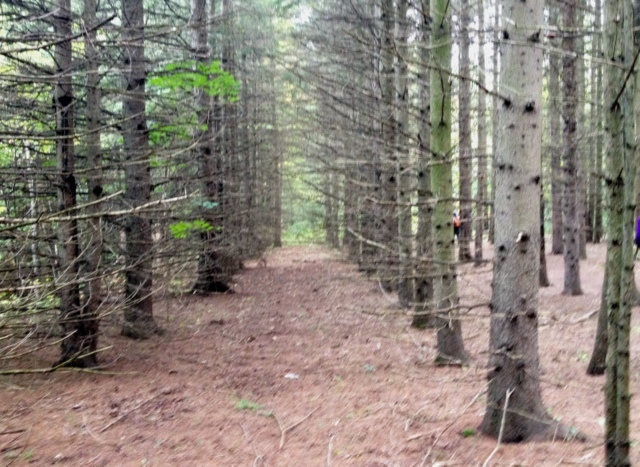 This also meant out of the woods into more urban area of the trail. The remaining hike went through the grounds of Scotdale Farm, road ways and finally the Limestone parking lot was in sight. Day 1 was now completed and we had accomplished 28 Km. The weather was most co-operative. What we needed was a relaxing bath and a good night sleep to recover for the following day. Reference: The hike followed Maps 13 and 14 of the Bruch Trail Maps and Trail Guide Edition 27. 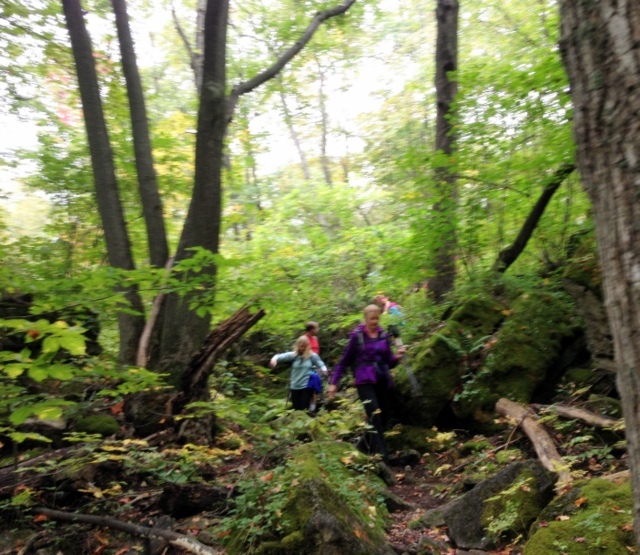 This entry was posted in Hiking, Leisure, Nature, Trails and tagged Bruce Trail, Bruce Trail Toronto Club, Toronto End-to-End on October 14, 2013 by Opalla. 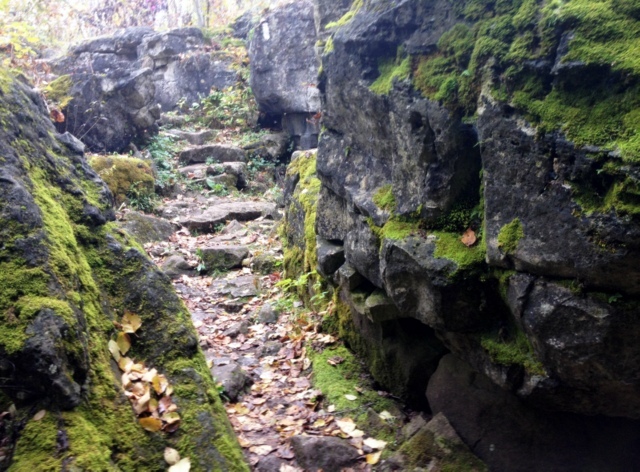 The Bruce Trail in Ontario is divided into nine sections, each of which is maintained by volunteers from the local areas. I often hike in the Iroquia and Niagara regions, which are the two southernmost sections of the Trail. 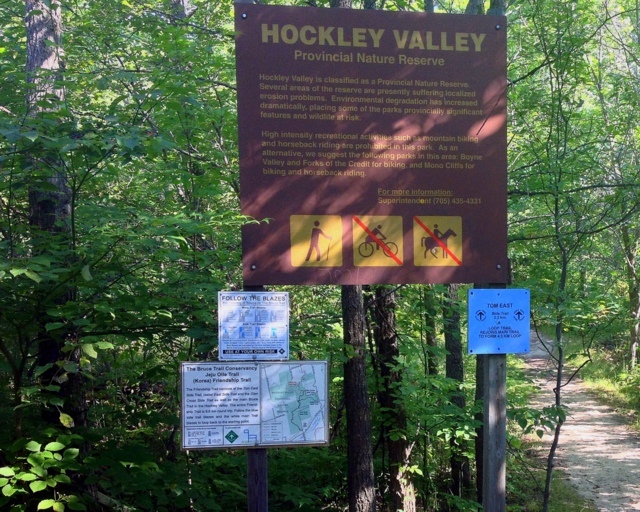 For a change, my hike today is at Hockley Valley of the Caledon Section. We enter the trail by walking up an incline, and there is a sign indicating that this trail has a friendship counterpart in Korea. 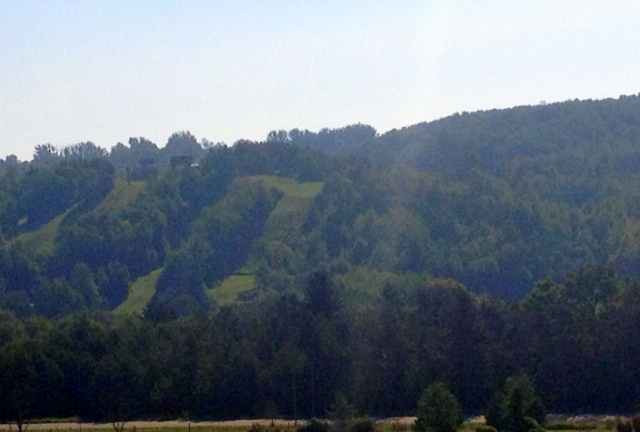 The Hockley Valley is known as a popular resort–golfing in summer and skiing in winter. From the trail, we can see the ski runs looking green but deserted at this time of the year. It is a hot day, but the trail is shaded. It seems to be so as we move further into the forest away from the farms. But first, we say hello and goodbye to the cattle fenced behind the trees. 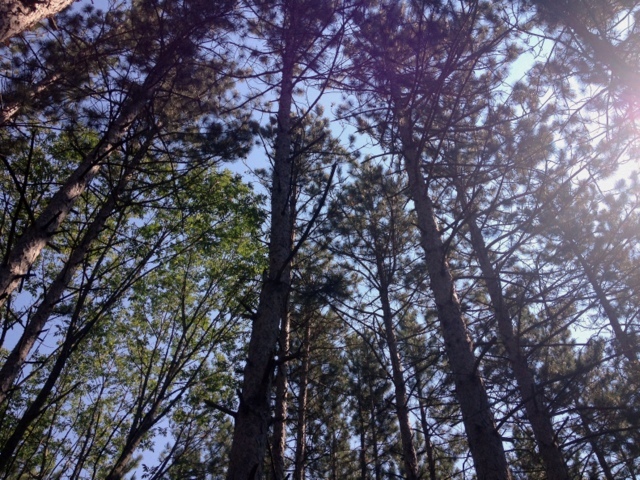 I notice that the trees are a mix of deciduous and pine. The predominance of pine means that we are north of the Carolinian forest that I often see hiking further south of the province. We enter Tom East Side Trail. 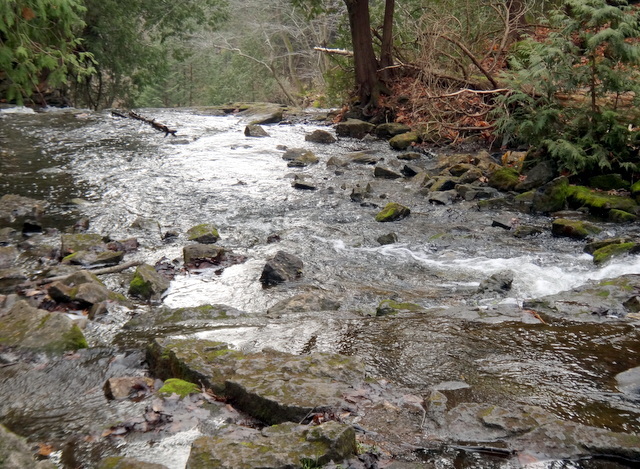 There is a narrow water way along the trail, but it does not look like a natural stream. Our experienced hike leader explains that this is a ditch dug single- handedly by the wife Tom East, Isabel, when she was in her seventies. 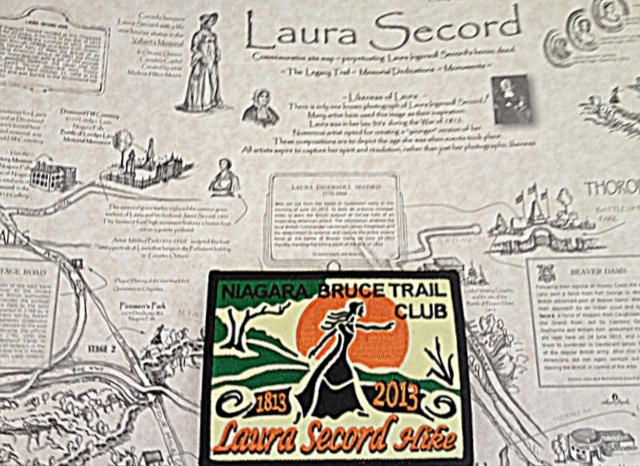 Both husband and wife were avid hikers and contributed much to the Bruce Trail. 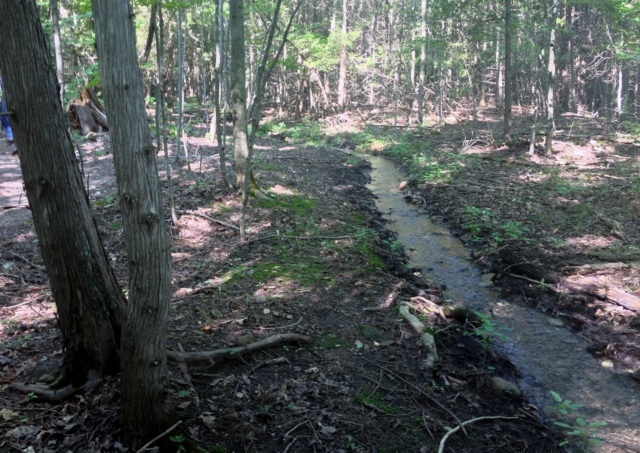 The ditch is meant to drain water away from the higher grounds to avoid flooding. 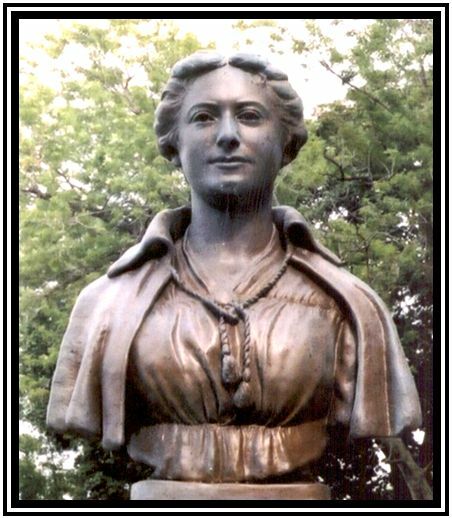 There is also a side trail named after Isabel, except that we are not hiking there this time. 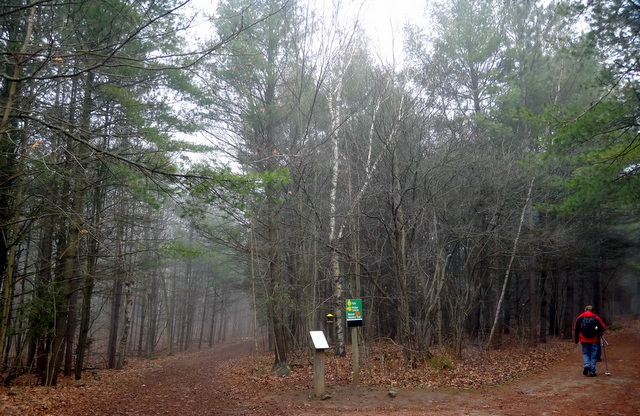 Our route takes us to Glen Cross Side Trail and Snell Side Trail, and we hike on the Main Trail (Bruce Trail) in between. We cross several streams, and we seldom walk over as many bridges or board walk as this morning. We come to an open field. The ski hills are now in a distant in a different direction. Fortunately we do not have to walk too long in the sun and we are back into the forest again. Tall trees and running water again. You may wonder if we take any breaks. Indeed we do for a hike of 13 to 14 Km like this morning. Besides a half hour lunch break, we take water breaks after walking up a hill, and quite often when we pause to examine unusual flora. 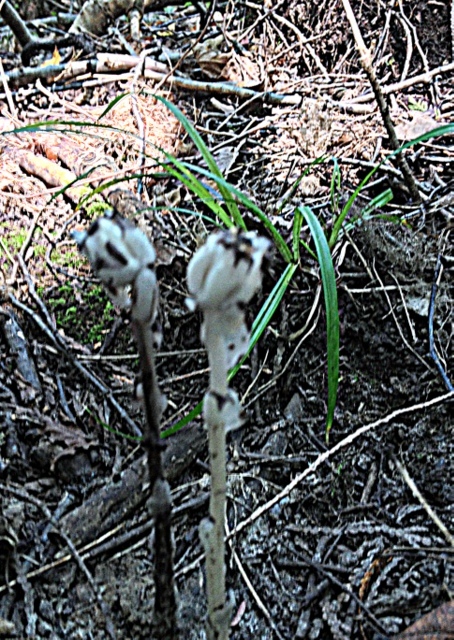 This is the Indian Pipe, a native plant. This is even more unusual. Nobody knows how it gets here in the first place. 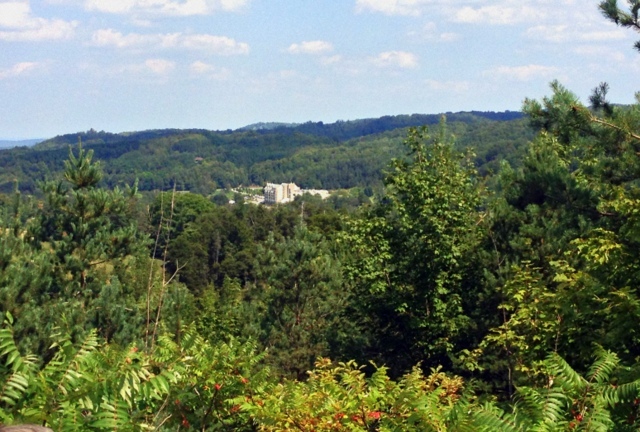 The grand finale is a panoramic view of the Valley and we can see the Hockley Valley Resort Hotel in the heart of the valley. We also notice a hint of red among the green leaves. We are counting our summer hikes before we begin to hike for the Fall colours. This entry was posted in Hiking, Nature, Trails and tagged Bruce Trail, Bruce Trail Caledon Club, Glen Cross Side Trail, Isabel East, Snell Side Trail, Tom East Side Trail on October 9, 2013 by Opalla. Everything I saw on my hike on the River and Ruin Trail in the Lowville Park area in Halton Region, Ontario was a representation of Spring. I am therefore integrating this as my submission to Cee’s Fun Foto Challenge: SPRING. The moment we set out on our hike from the carpark, Spring was tangible. Photography could only capture what one could see. The green of the grass and the leaves is a Spring green, which looked so promising after the rain from the night before. I could hear Spring from the birds’ singing and chirping, and the rustling of the wind, I could feel Spring from the cool, refreshing breeze, and I could smell Spring in the air. The flowering trees were starting to bloom and the open fields were covered with dandelions, bright yellow contrasting with bright new green. Other vegetation, from the fern to the May apple (with its bud hiding underneath the leaves), the trilliums to the marsh daisies are out. I saw the Bracket Fungi for the first time. We also spotted the Garlic Mustard, an unwanted foreign specie because they would edge out the other plants. 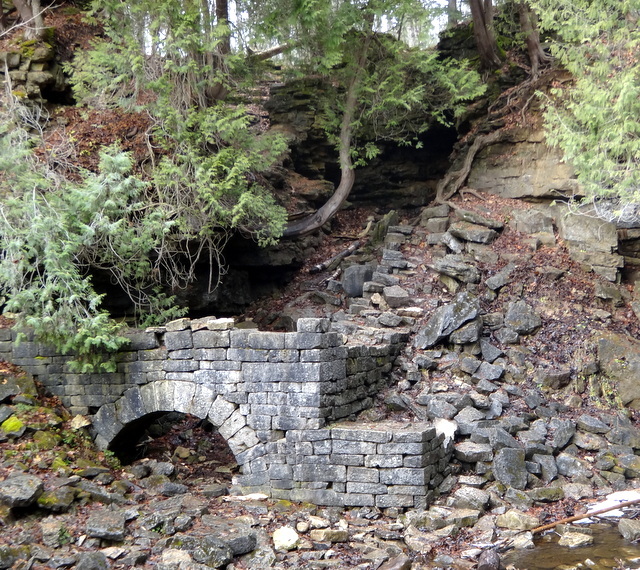 We took the River and Ruin Side Trail, crossed a bridge to join the Bruce Trail Main Trail. 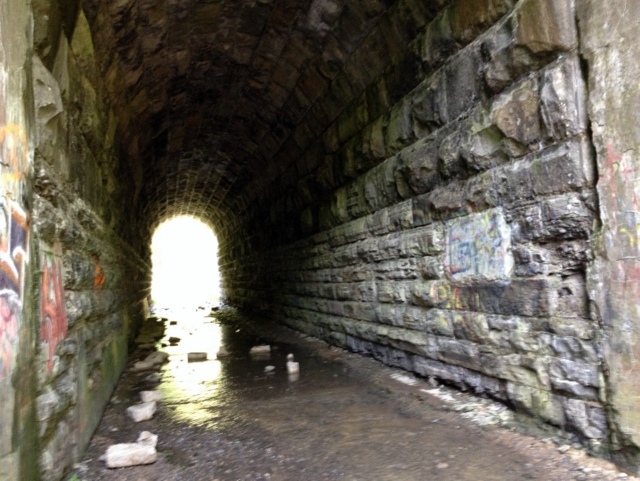 We hiked to Kilbride, took a lunch break and hiked back, using a different arm of the side trail to see the ruin. The water level was high and we had Bronte Creek to our right for half of the hike. The ruin appeared as a surprise among the trees. It was the relics was a big farmhouse. 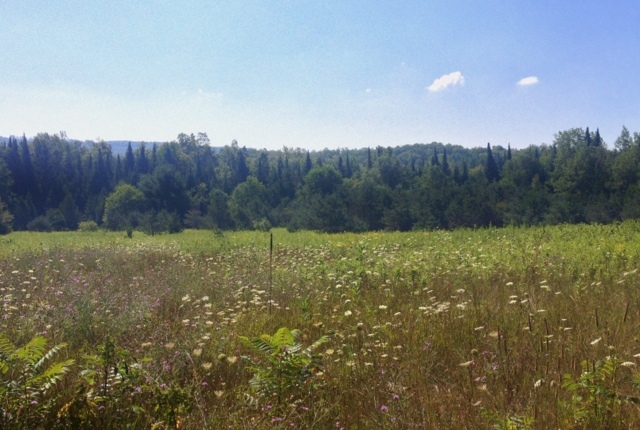 We had to use our imagination to think back two hundred years ago when this part was farmland and the residents were using out hiking trail to go to their general store in Lowville. What kind of bridge did they have back then? 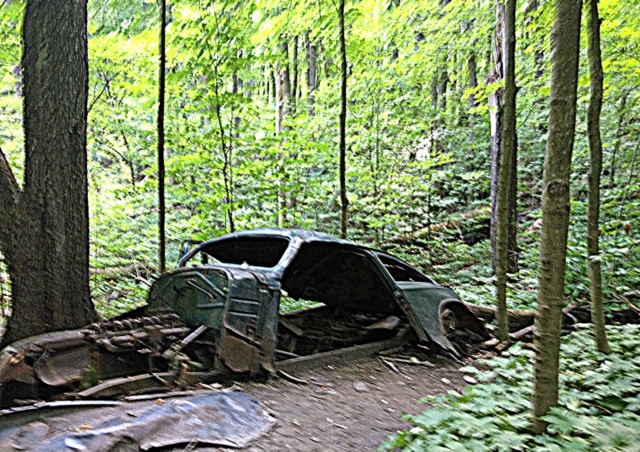 This entry was posted in Hiking, Leisure, Life, Trails and tagged Bruce Trail, Lowville Park, River & Ruin Side Trail, spring hike on May 19, 2013 by Opalla. 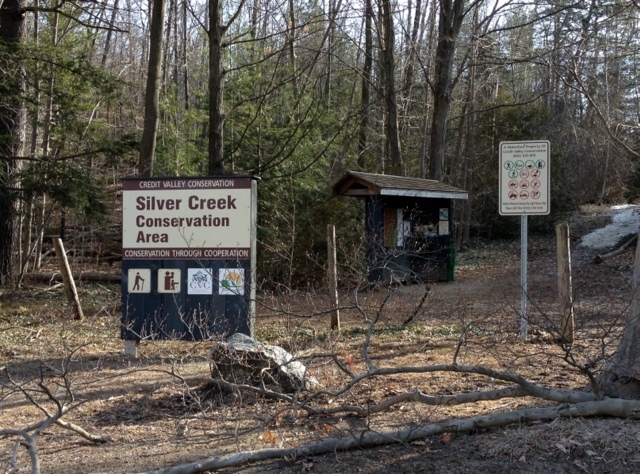 Our hike today was in the Silver Creek Conservation Area. 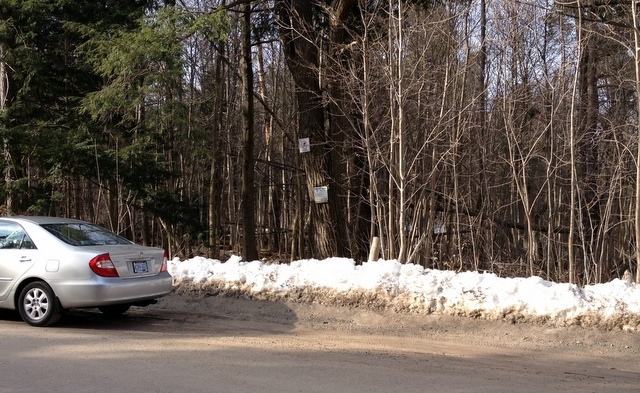 None of us going on the hike had expected that there was a snow bank by Fallbrook Trail, where we parked our cars. 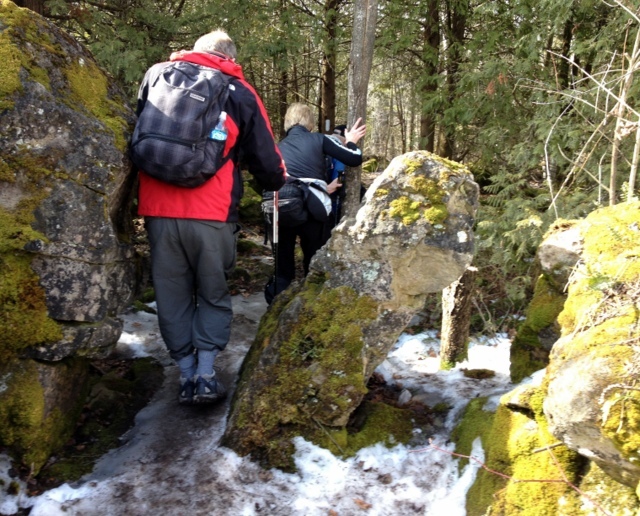 Our experienced hike leader immediately checked to see if anyone of us had our icers/tracks with us. Well, none of us did, except him. He put his on and he had a spare pair that he offered to our “sweep”, the person who stayed at the back to make sure nobody got lost. 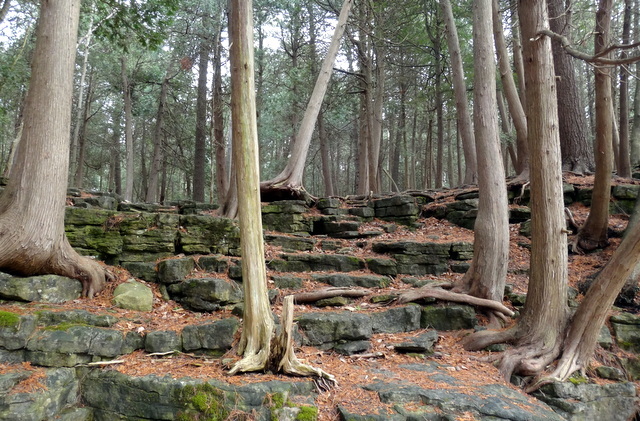 We began our hike by walking less than 200 metres of the Irwin Quarry Side Trail, which joined the Main Trail of the Bruce Trail and we started our climb of the Niagara Escarpment. No sooner had we entered the wood than we realized that surprises were waiting for us. The trail was in parts still covered with snow and shiny icy patches were visible. We landed our feet as carefully as possible, but the slipperiness could not be easily ignored. As we continued, we tried to develop strategies to avoid slipping. One hiker suggested walking on the crystalline snow, which crumbled under our feet; at least the footing was better than ice. However, there were sections where we had no choice. All we could do was to slow down, use our hiking pole to anchor before landing. At times, we latched onto tress and swung our bodies forward. There was one narrow strip which was covered by ice and in the absence of an alternative path, the only way to get pass was to hang on to the rocks, aimed for a tree ahead and grabbed it to come to a stop. It was treacherous! However, I was excited that I was hiking in an area that I had never hiked before. 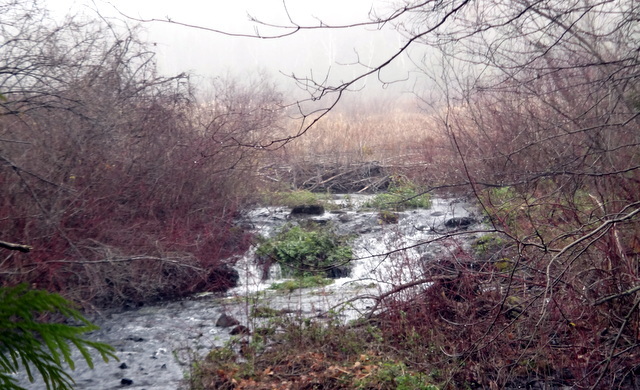 The rushing of the Silver Creek could be heard for a good distance even though it was not in sight. Then it appeared, with snow banks in parts, and we crossed this creek, which was a feeder stream into the Credit River a couple of times. The hike took longer than anticipated, because we had to slow down frequently. It was incredible that within a short span of time, we were treading on ice, snow, water, mud and dry grounds. 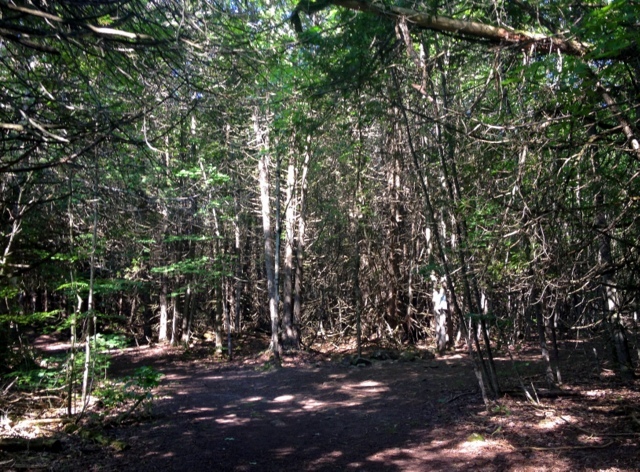 The hike took us on part of the Bruce Trail Main Trail, the Great Esker (side) Trail and the Bennett Heritage (side) Trail. We passed en route Scotdale Farm and crossed also the Snow Creek. 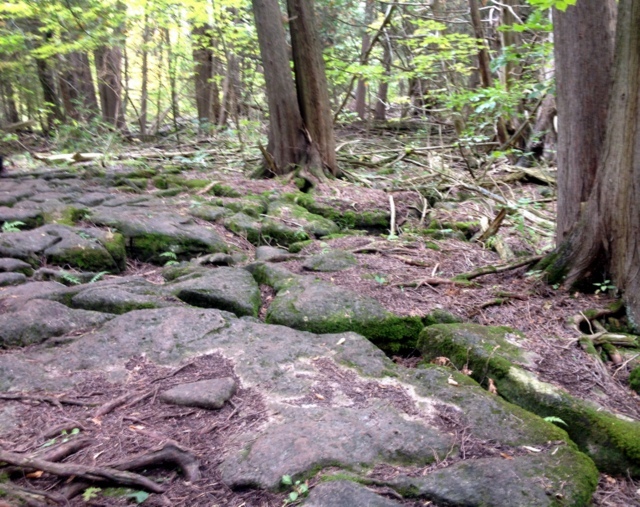 This section of the Bruce Trail was under the stewardship of the Toronto Club. Two hikers fell, but fortunately nobody was injured. The experience was unique, and we were all relieved to be eventually out of the woods. Map Reference: Bruce Trial Reference Map and Trail Guide Edition 27, p. 13. 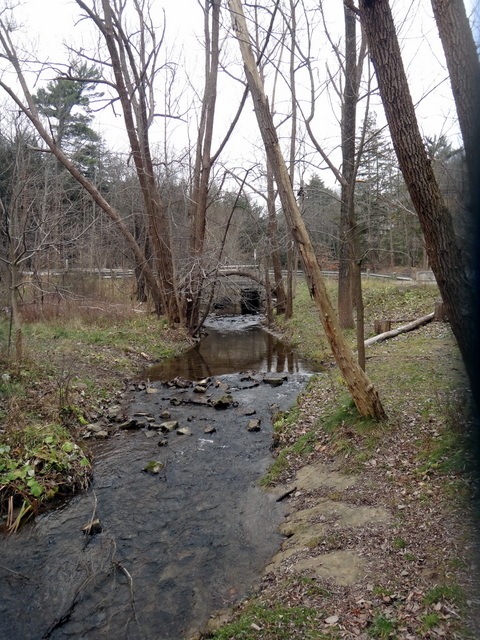 This entry was posted in Hiking, Nature, Trails and tagged Bennett Side Trail, Bruce Trail, Bruce Trail Main Trail, Silver Creek Conservation Area on April 22, 2013 by Opalla. 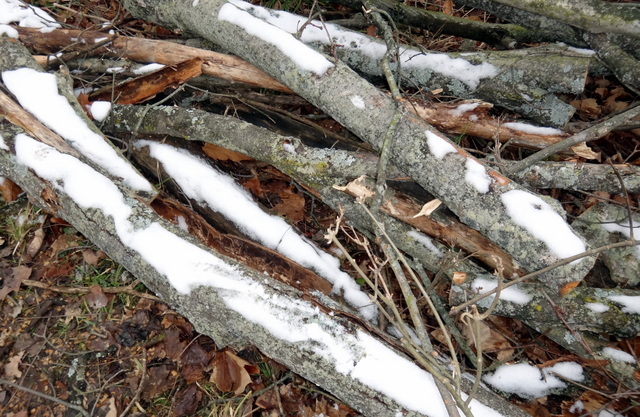 The first thing I noticed when I set foot on McCormack Trail in the Dundas Valley Conservation Area this morning was the snow from overnight on the fallen trees trunks. It was a good reminder that before too long, we would be hiking with our snow tracks. 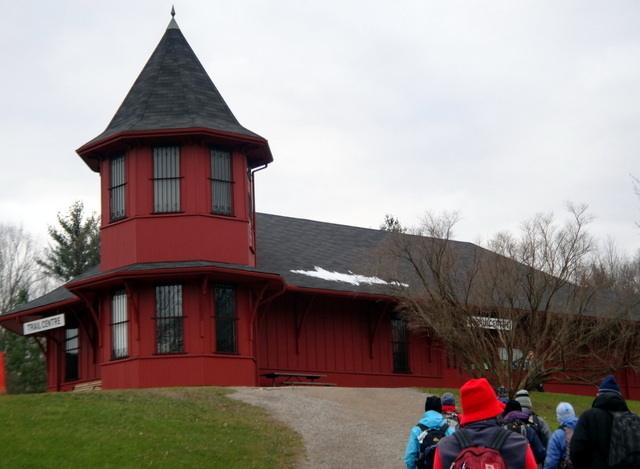 The McCormack Trail was a gentle trail which went through open fields and it had an incline at the top of which, we could enjoy the panoramic view of Hamilton. Flanking the roadside and meadows were goldenrods which had turned silvery white. 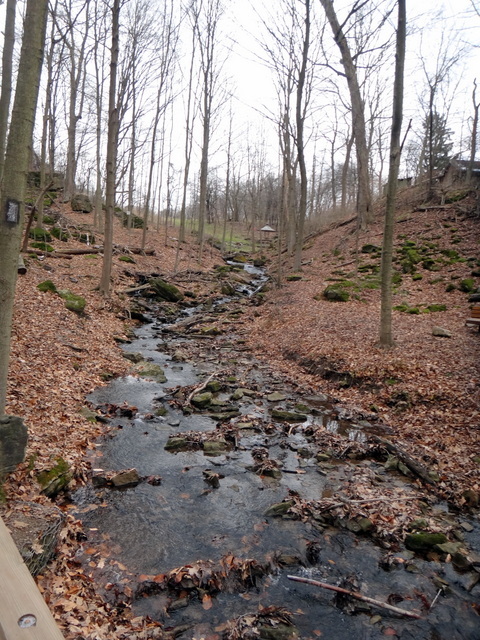 After doing a loop on the McCormack Trail, we took up part of the Main Loop of the Bruce Trail, and hiked on the John White Trails, joined the Sawmill Trail before ending our hike from Spring Creek Trail after hiking for 14 Km. 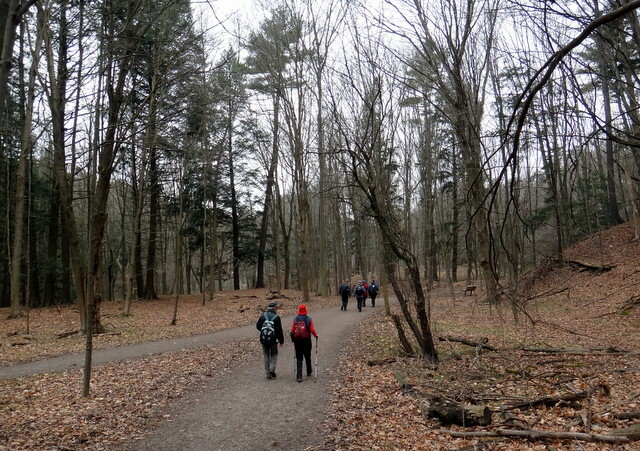 The fun of hiking in Dundas Valley was that the trails with mostly interconnected and under the guidance of an experienced hike leader, we could customized our distances. 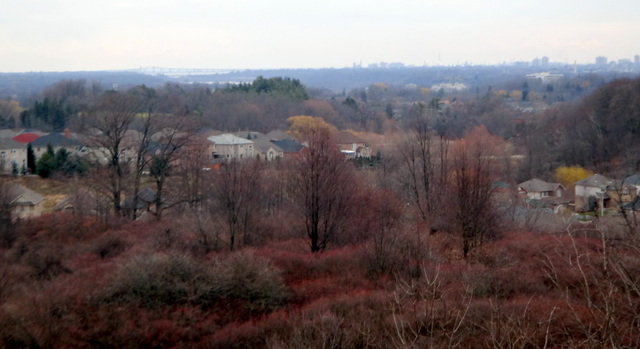 Today we returned to the Trail Centre of the conservation area from the back, just a different view from the Hamilton-Brantford Rail Trail. 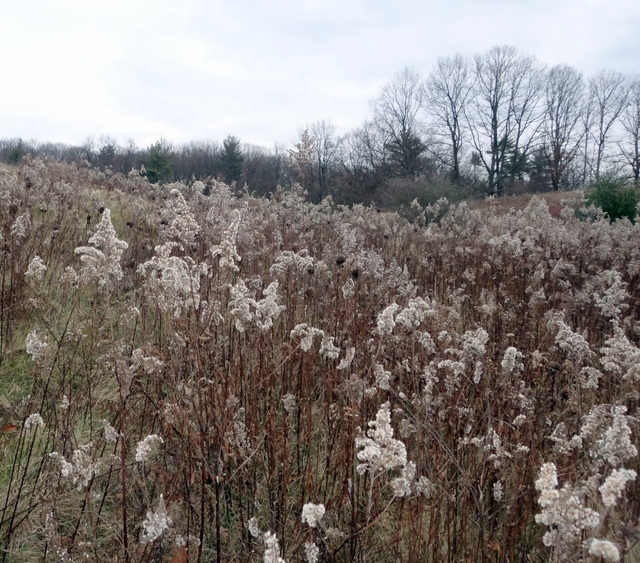 This entry was posted in Health, Hiking, Nature, Trails and tagged Bruce Trail, Dundas Valley Conservation Area, John While Trail, McCormack Trail, Sawmill Trail on December 10, 2012 by Opalla. This was my first hike since my long End to End hikes four weeks ago. I was admiring Fall colours on my hikes back then, and now, the trees were all bare as they displayed a sense of ethereal beauty on this foggy morning. 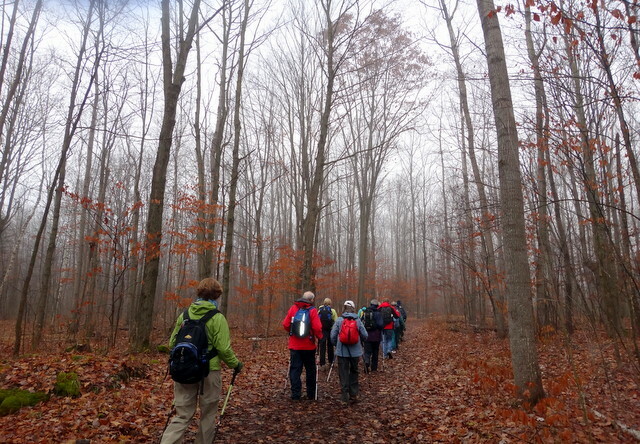 My hiking group set off from the Hilton Fall Conservation Centre and our goal was to explore some of the overlapping trail loops in the conservation area before reaching the Hilton Fall. (For any visitor who just wishes to visit the Fall, there is a trail of about 1 Km in distance that leads directly to it.) 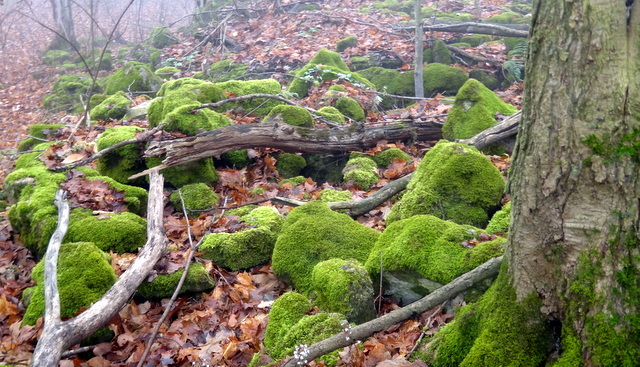 For us, we first entered the Philip Gosling Side Trail and after a short walk, I was attracted by the moss-covered rocks which jutted from the brown fallen leaves. Middle Earth, anyone? We joined a short section of the Bruce Trail Main Trail and turned into Red Oak Trail, which also was a Bruce Trail side trail. This was probably the most beautiful and challenging section of the hike. It rose above the Hilton Fall Reservoir, that we caught a glimpse of it occasionally from among the trees. All around us was moss-covered landscape. There were caves and cliffs and rocks, but photography was impossible, because with this terrain, it was easier to keep going than to attempt to balance and focus into a camera. In fact, I possessed neither the balance nor the photographic skills to even attempt. Next we joined the Hilton Fall Trail, towards the direction of Beaver Dam Trail on the right of the fork; the left trail should lead directly to HIlton Fall. 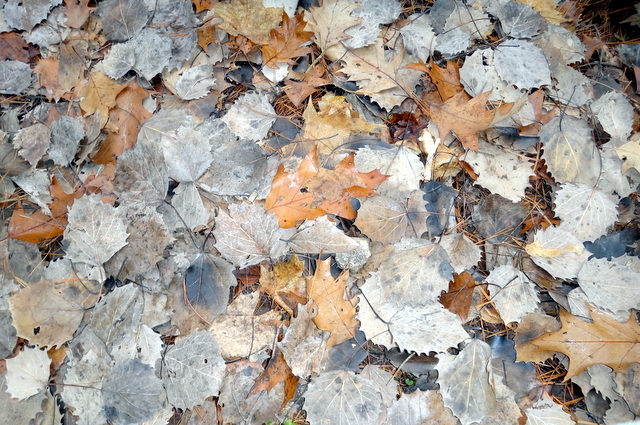 The ground cover on the trail was a mottled brown and silvery grey. One of the hikers who knew about forestry explained to us that the trees were planted in “military formation”, as they were straight and orderly. We crossed the Beaver Dam, from which the trail was named, but there was a dam no more, because what used to be a beaver dam had blocked the flow of the water. 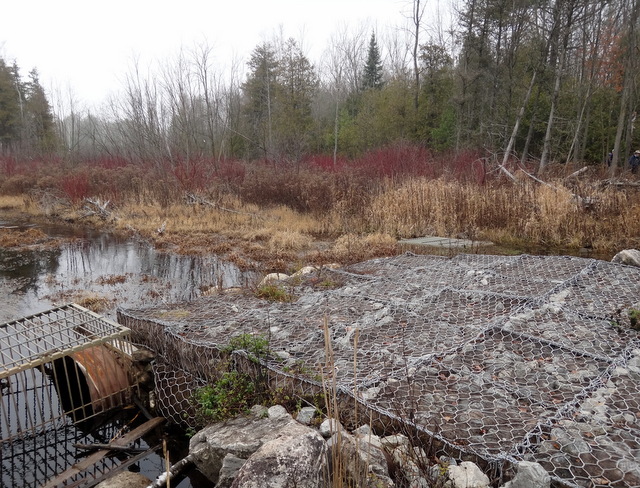 Instead, we walked over a structure which served the purpose of a bridge and at the same time should prevent beavers from building a dam here. The stream here is one of the feeders of the Sixteen Mile Creek. 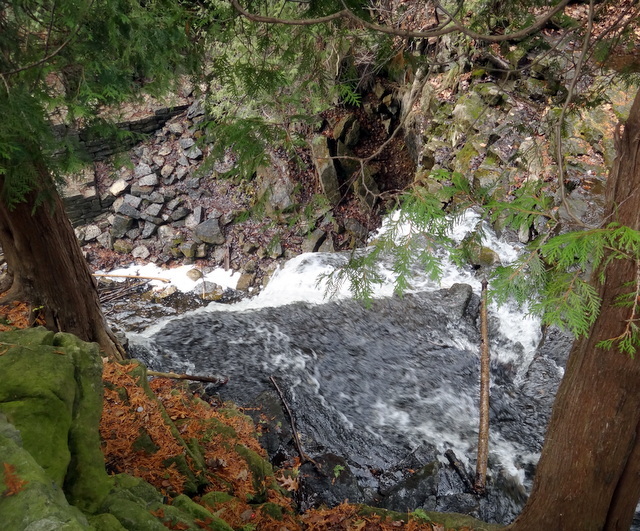 We took a rocky side trail following the Bruce Trail blue blazers and arrived at the picnic area of Hilton Fall! As a result of the persistent rain the previous month, water was rushing down the cliff edge of the Fall. I was finally able to take a picture of the Hilton Fall in clear weather. 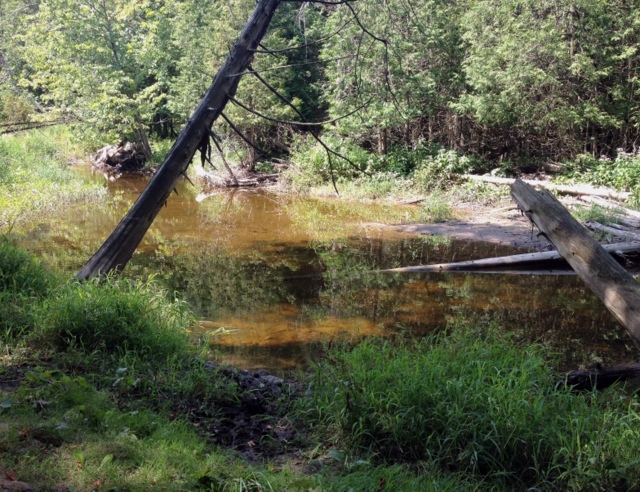 Just beside the Fall was was remains of a sawmill which dated back to the 19th century. 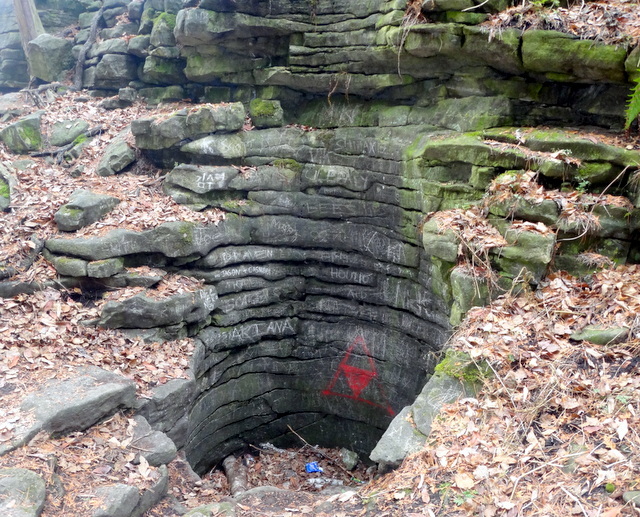 Besides heritage remains, another landmark revealing the history of the area was the pothole formed by the glacial swirl millions years ago. 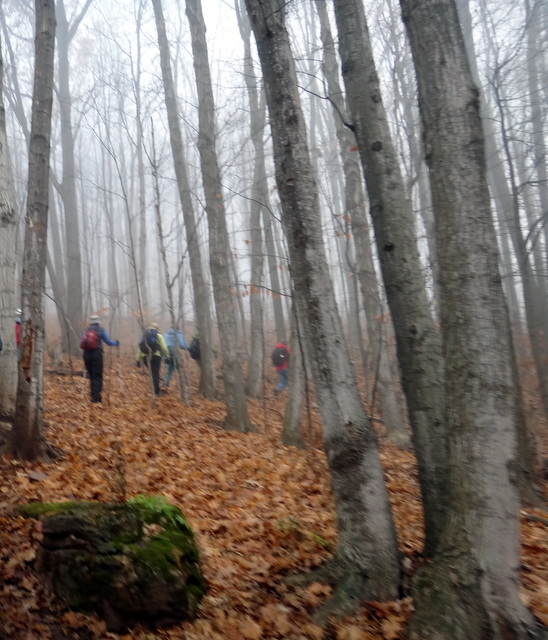 We broke for lunch and then made our descent back to the conservation center. I paid attention for the first time to the tamarack (larch). I always learned something when I hiked with this group of experienced hikers. 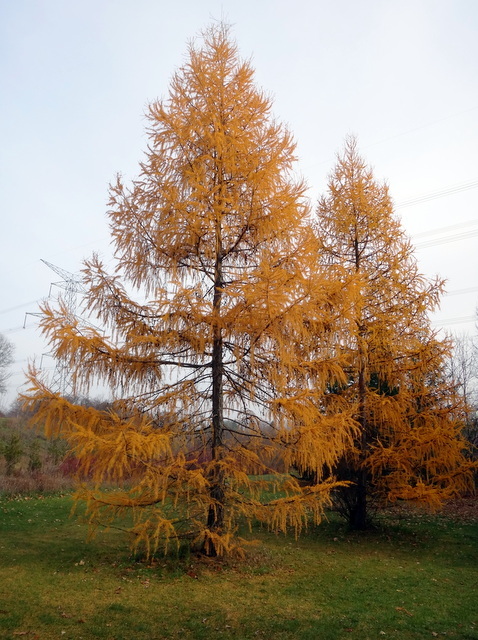 In spite of its coniferous shape and needle-like leaves, the tamarack is a deciduous tree which shed their leaves in autumn. Its wood is used by the Algonquian natives to make snow shoes. Its golden glow transported me to a sense of satisfaction and peace as we concluded this hike. 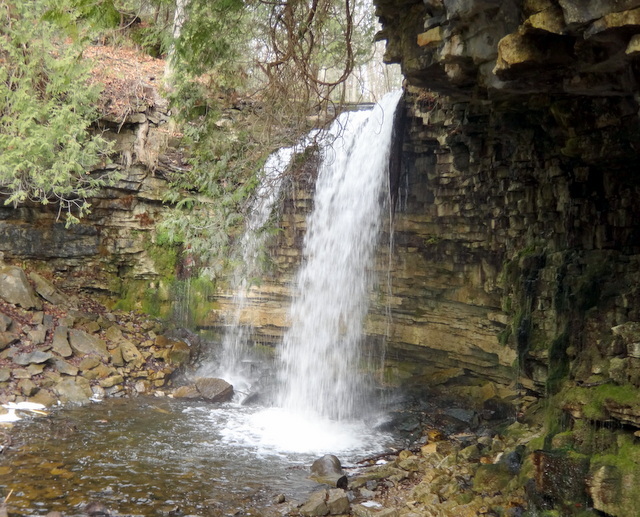 This entry was posted in Hiking, Nature, Trails and tagged Beaver Dam Trail, Bruce Trail, Hilton Falls, Hilton Falls Conservation Area, Hilton Falls Trail, Philip Gosling Side Trail on November 26, 2012 by Opalla.